In preparation for the release of this interview, Lisa Landwirth Ullmann ‘01 commented that, “I believe my father and our family have managed to heal ourselves through giving to others.” There has been much to heal. 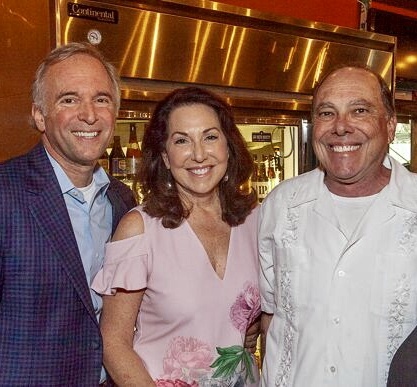 Lisa’s father, a Holocaust survivor, founded the Fanny Landwirth Foundation (FLF) in honor of his mother Fanny, who was brutally murdered by the Nazis during the Holocaust. Now Lisa and her siblings continue her family’s legacy of philanthropy by advising the Henri Landwirth Family Advised Fund through TCF. When a beloved family member died on 9/11’s Flight 93, Lisa again worked to heal her family, as well as 80,000 others and counting. In 2001, she co-founded the program now known as Art with a Heart in Healthcare. A: When I’m not involved with work or philanthropy, one of my favorite morning activities is taking long walks on the beach with my dog, Humphrey (5-year-old Havanese). I’ve recently been taking golf lessons with my daughter, Emily and loving it. In 2012, I started a residential Interior Design firm, Ullmann Design, Inc. and have enjoyed working with clients on different coastal projects at the beach and in Jacksonville. My husband and I love to travel and explore new places but most recently we’ve spent more time in Washington, DC with our daughter, Sarah and son in law, Nate, as well as 1½-year-old Grandson, Owen. Q: Whom do you consider to be your role models for giving? A: My mother and father Jo and Henri Landwirth, were both very influential in serving our community. My mother volunteered for years as a Pink Lady at our local hospital, giving timeless hours to help others in need. My father, a Holocaust survivor, had great compassion for others and focused his giving on what he had to endure as a child in the concentration camps. At risk youth and families, homelessness and food insecurity were areas of giving close to his heart. Seeing both of my parents give back to their communities was the leadership foundation for my future philanthropy. Q: How would you describe your family’s traditions around giving? A: I remember my father always telling us to “get involved” in giving; don’t just write a check. Working for non-profit organizations such as Big Brothers and Big Sisters was an important part of my work experience. It helped me understand the enormous challenges in the underserved population. Being a Trustee on different nonprofit boards such as the Baptist Health Foundation, The Monique Burr Foundation, and WJCT also gave me immeasurable insights to needs in the community and how to be a better community advocate. Q: How have you engaged multiple generations in your giving? A: My father founded the Fanny Landwirth Foundation (FLF) in 1985 and named it after his mother Fanny, who was brutally murdered by the Nazis during the Holocaust. He invited my brothers and me to participate in our late teens and gave us a true gift of giving. We had an opportunity to learn philanthropy by serving on the board. We learned how to make grants, read 990’s, balance sheets, and make site visits to nonprofits at an early age. We also included our children in the next generation of giving by inviting them to participate on a “Next Gen” FLF board. We’ve since moved the FLF funds to The Community Foundation for Northeast Florida in Donor Advised Funds that we direct with our families in memory of our father. Q: What led you and your cousin, Lori Guadagno, to found Art with a Heart in Healthcare in 2001? A: Lori and I were always close cousins and shared a love of art and music. On 9/11, Lori’s brother, Richard tragically died on Flight 93, which changed our family forever and motivated Lori to relocate to Jacksonville Beach. We always had a dream of working together in a meaningful way. She had heard about an arts program in Vermont that worked with ill children in hospitals creating pieces of art. I worked closely with Suzanne Taylor, who was the Baptist Health Foundation President at the time, and we created an Arts’ in Healing: Healing Children’s Bodies and Spirits Through Art program at Wolfson Children’s Hospital and Nemours Children’s Clinic. It is one of my proudest accomplishments and it continues to serve over 80,000 patients and their families. This program is now known as Art with a Heart in Healthcare and it’s since expanded to The Mayo Clinic and St. Vincent’s Healthcare. Q: How do you balance giving from your heart and your head? A: Knowing the pain my family and so many other innocent victims had to endure in the Holocaust has shaped my conviction to help those in need. My heart always leads but learning the tools of grant making and evaluating the outcomes has also been necessary to be a good steward of the funds we distribute. Q: How do you use The Community Foundation for Northeast Florida as a resource for your philanthropy? A: The Community Foundation invited me to participate in one of the first Weaver Philanthropic Initiative classes, where I gained knowledge about the difference between charitable contributions and purposeful philanthropy. I’ve also been a member of the Donors Forum for 15 years and regularly attend the quarterly educational meetings. It’s given our Family Foundation a vehicle to collaborate with larger funders in the area. Four years ago, my husband Glenn and I joined the Beaches Community Fund with 30 other families to help strengthen our beaches non-profits. The Community Foundation has been an invaluable resource for education and collaboration. Q: What concepts or experiences from participating in the Weaver Philanthropic Initiative have proven valuable to your philanthropy? A: Towards the end of the course, we were asked to work to identify needs in our community and make a grant together. It was a more difficult task than I had anticipated because everyone had different interests and ideas. It was one of my first learning opportunities in collaborative grant making. Q: What have been your biggest learning “aha moments” as a philanthropist? A: Living at the beach for the last 30 years, I had no idea how much poverty and food insecurity there is in our own backyard. Through the Beach’s Community Fund we’ve been able to improve the quality of life for all Beaches residents and streamline access to services. Our main giving initiatives are learning opportunities for low-income students, affordable basic needs, and essential transportation.